With growing water demand and strained resources, Central is a leader in promoting water-saving products and best practices education. Sophisticated water management relies on gathering real-time data from the landscape. We offer a complete family of rain, freeze, flow, moisture and evapotranspiration sensors and weather stations to aid the professional in achieving optimal irrigation management. The hottest trend in landscape irrigation is new smart controllers that self-adjust their watering schedules. We offer smart controls that are wi-fi connected and that use climate-based (ET evapo-transpiration) and moisture-sensor based inputs for efficient scheduling. Ask us about the right choice for your project. High-efficiency precision and rotary nozzles can improve virtually any existing system’s water efficiency. They also restore the viability of installations with poor coverage or inadequate hydraulics. 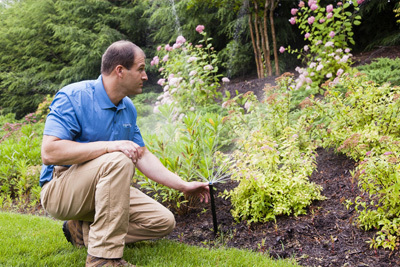 They reduce water use by up to 30% without lowering turf vigor or quality.